This image shows an actual surgery patient of Dr. Niamtu. 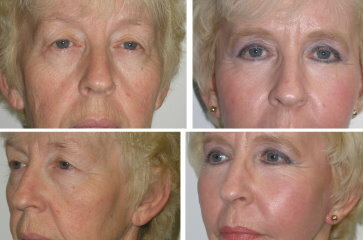 The aging midface (left) is rejuvenated by lower eyelid surgery and cheek implants (right). Facial aging is an interesting multi factorial phenomenon. Many things contribute to an aged midface including sun damage to skin, atrophic and gravitational changes to fat, muscle and bone. Two of the biggest things that make us look old and tired occur in the lower eyelids and cheeks. The lower eyelids can undergo aging changes as early as the third decade. The skin becomes crinkly and sags, fat can protrude from around the eyeball and produce sausage shaped fat bags on the lower eyelids. This protruding fat also causes a shadow from overhead light which contributes to the dreaded “dark circles” under the lower lids. In addition, due to the aforementioned changes, the “tear trough” (technically the nasojugal groove) becomes accentuated. This produces a deep grove under the eye from the side of the nose across the cheek. Extremely related to midface aging is volume loss in the midface. Young patients have full, plump and rounded cheeks. This good fat in good places produces a smooth, continuous contour under the eyes and around the cheeks. Gravitational and atrophic aging changes causes volume loss in the cheeks and gives us a drawn, gaunt and hollow appearance. This is also very related to the lower eyelid aging as the lower lids are the upper cheeks. The combination of aging produce an old and tired look and the only means to address this aging comprehensively is to address both the lower eyelids and cheeks at the same time. I find it rare that patients with lower eyelid aging don’t need attention to the cheeks (midface). 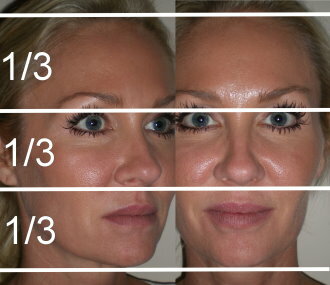 I would say that 95% of my lower lid patients that are over 40 would benefit from simultaneous midface augmentation. Fortunately, many of these patients understand this and combing procedures. My approach to the healthy lower lid is pretty simple. I remove conservative fat with a laser incision from the inside of the lid (transconjunctival blepharoplasty). This means no external scar and no bleeding due to the laser. No bleeding means faster surgery and recovery with less bruising and pain. I am always very careful to only recontour the excess fat as not to produce further volume loss. The second step of lower eyelid rejuvenation is addressing the aging skin of the lower lids. Although some surgeons still cut off lower eyelid skin, I think that is a bad idea. It only stretches the skin; it does nothing for rejuvenating the skin. The skin will return to its normal wrinkling in a short time. More of a problem is the fact removing skin from the lower eyelid can also contribute to lower eyelid malposition. Due to the scarring that can occur inside the lower lid, the eyelid can be pulled down which looks unnatural and can cause problems. To truly rejuvenate the lower eyelid skin, it needs to be resurfaced. I prefer CO2 laser resurfacing or chemical peeling. These modalities actually remove wrinkles and brown spots and makes new, younger skin. That is truly rejuvenation! Since the aging does not stop at the lower lid, this is an excellent time to also address the midface. The patient is already sedated and will be taking a week off of work, so why not be comprehensive with the rejuvenation? My most common method of augmenting the aging midface is the use of silicone cheek implants. (Click here to view a video about cheek implants and facial aging). There are many reasons that I like cheek implants. Among them is the fact that they are inserted from the inside of the mouth so there is not visible scar. They are held to the cheekbone with a micro screw, so they are permanent, but they can be changed or removed in 30 minutes if the patient desires. 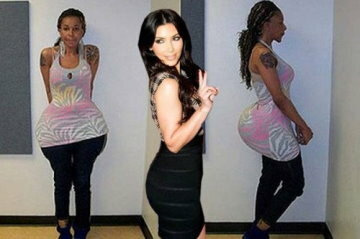 Not many things in cosmetic surgery are permanent but reversible! By placing cheek implants, the youthful contour of the midface is reestablished and many times the tear troughs and even the nasolabial folds are also improved. Alternatively, the cheeks and tear troughs can be volumized with injectable fillers. This is non-surgical and is also reversible. The downside of midface filler augmentation is that it is a temporary fix. Simultaneous rejuvenation of the lower eyelids and the cheeks is a winning combination. If a patient seeks lower eyelid rejuvenation and the surgeon does not discuss the midface aging, a second opinion may be in order. Although 99% of my blog entries involve cosmetic surgery, I occasionally write about more personal issues. About a year ago, I wrote a blog about being a vegan. I had just read “The China Study” by Colin Campbell at the recommendation of about every cardiologist and cardiothoracic surgeon I know. I was impressed by the medical evidence in favor of a plant based diet so my wife and I decided to take the vegan plunge for 365 days to fully evaluate the benefits. The good news is that my cholesterol dropped a whopping 50 points, which is pretty amazing. My doc still recommended my staying on a statin for beneficial anti-inflammatory effects. I have never been a junk food person and have always eaten pretty healthy, low carb and low fat, but did eat lean meats and fish. Going vegan meant no animal products, no meat, no dairy or cheese, no fish. Pretty much sounds like a prison sentence for the average American. The switch over was pretty seamless as we shopped at health food stores and substituted much of our previous diet with soy alternatives. Actually it was sometimes hard to tell a difference. The main problem with the vegan diet is the difficulty of keeping carbs low and protein high; the opposite of my diet for the last 3 decades. I, unlike many people, actually gained a little weight which I attribute to the increased carbohydrates. Did I feel any better? The answer is somewhat disappointing no. I never felt bad before the diet and did not feel better on the diet. Having said that, you cannot feel “prevention” so it was not like I expected some huge boost. 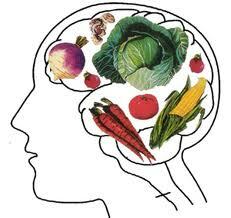 There is no doubt that the biggest problems with a vegan diet were boredom and inconvenience. If you grew up with a typically omnivorous diet, it is tough to totally eliminate animal products for the rest of your life. If you were raised on a plant based diet it would be much easier. Also, variety is important in any diet and the options are much decreased with the vegan diet. I missed sushi, fish and turkey, but never craved it and never cheated for a full year. The inconvenience is probably the biggest issue. First of all, shopping is difficult because not all stores carry vegan items. They are also much more expensive and much to my surprise very heavy laden with sodium. Perhaps the worst inconvenience is eating out. This is twofold. One problem is finding vegan items on typical restaurant menus. Many have them, most will do something special and some ask what is a “vegan”? Akin to this is the fact that the “veganites” become the center of attention which inevitably slows down the ordering and service and creates a hassle factor, as the server has to leave the table and speak to the chef, etc. Secondarily is the kidding and harassment from your friends. People are always willing to bash those whom are different and this is a great opportunity! My carnivorous pals would whip me unmercifully about being “veggie boy” and the usual diatribe inspired by meat eating hedonism. Gotta’ have thick skin to be an out of the closet vegan. In any event, I gave it an entire year, 365 days. I eased back into (as Jimmy Buffett would say) my carnivorous habits. I did maintain some vegan vestiges such as soy or almond milk and vegan chili but added back fish and white meat poultry. I missed it, but did not crave it. So………….bottom line, being a vegan is rigid and difficult and I applaud those who are able to do it permanently. I gave it a good go and really did not notice any outward differences, but appreciated the cholesterol improvement. We all realize the benefits of a plant based diet and I feel that it is important to lean that way but I also believe that lean meat and fish also have benefits and using moderation is perhaps more important that severely limiting diets.